Definition at line 78 of file DebugLinesSubsection.h. Definition at line 53 of file DebugLinesSubsection.cpp. Definition at line 93 of file DebugLinesSubsection.h. Definition at line 87 of file DebugLinesSubsection.h. 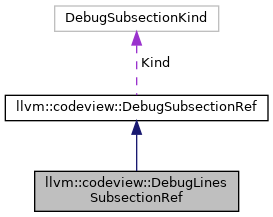 References initialize(), llvm::codeview::DebugSubsectionRef::kind(), and llvm::codeview::Lines. Definition at line 94 of file DebugLinesSubsection.h. Definition at line 67 of file DebugLinesSubsection.cpp. Definition at line 96 of file DebugLinesSubsection.h. Definition at line 56 of file DebugLinesSubsection.cpp. References llvm::BinaryStreamReader::bytesRemaining(), llvm::codeview::EC, llvm::VarStreamArray< ValueType, Extractor >::getExtractor(), llvm::codeview::LineColumnExtractor::Header, llvm::BinaryStreamReader::readArray(), llvm::BinaryStreamReader::readObject(), and llvm::Error::success(). Definition at line 79 of file DebugLinesSubsection.h.